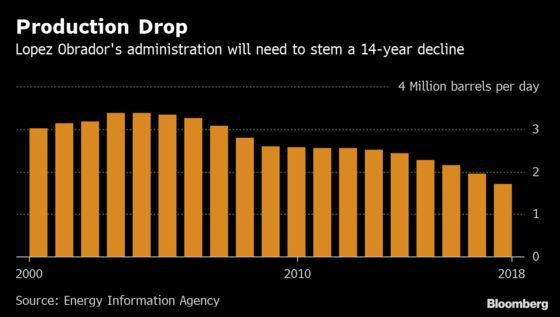 (Bloomberg) -- True believers in Petroleos Mexicanos are fueling a rally in its bonds, reckoning that government support for the beleaguered state-owned company will ultimately provide a backstop from any troubles. Investors including MetLife, Pictet and SMBC Nikko Securities say Pemex’s bonds were overly punished last year amid concerns the government isn’t doing enough to address the company’s problems. The challenge of falling production given Pemex’s $108 billion of debt and high taxes is real, but optimists argue its yields shouldn’t be much above sovereign notes. “The ironic thing about Pemex is that the worse the credit profile deteriorates, the more it becomes a sovereign credit,” said Roger Horn, a senior emerging-markets strategist at SMBC Nikko Securities America in New York who is traveling to Mexico with a group of investors next week to scout opportunities. Pemex’s benchmark bonds due in 2027 returned 4.1 percent last month, almost three times the average for a Bloomberg Barclays index of government and quasi-sovereign notes from emerging markets. The extra yield the notes pay above similar-maturity securities from the government has fallen to 2.5 percentage points -- still about 50 basis points over the past year’s average, but down from 2.95 percentage points in early January. The spread is as high as 5 percentage points for some euro- and peso- denominated bonds. Mexico’s state oil producer had suffered in bond markets in recent months as some analysts and investors began to view its problems as so big that even implied government backing wasn’t enough to put their minds at ease. Generally, notes from state-owned companies -- known as quasi-sovereigns -- are seen as less risky because of the government backstop. “Mexico’s significantly greater budgetary dependence on Pemex likely implies a greater chance of the company receiving government aid” if it needs it, according to Jaimin Patel, an analyst at Bloomberg Intelligence who says the Mexican producer’s credit rating might be a full eight levels lower without the government backing. Guido Chamorro, who manages $4.5 billion of assets as co-head of emerging-market hard-currency debt at Pictet, recently added to his holdings of Pemex’s 2027 bonds, according to data compiled by Bloomberg. Chamorro says that Mexican President Andres Manuel Lopez Obrador will do what it takes to shore up the company’s footing. He’s on the lookout for a rating downgrade -- S&P Global Ratings and Fitch Ratings have said they may cut the producer’s investment-grade ranking -- because any dip in prices could be an opportunity to buy more. Fitch cut Pemex’s rating by two steps earlier this year to BBB-, the lowest investment grade. Moody’s has Pemex at the same level, while S&P has it two levels higher at BBB+. The company’s ratio of net debt to a measure of earnings, an indication of indebtedness, was 3.7 at the end of last year, among the highest globally. The press departments at Pemex and Mexico’s Finance Ministry didn’t immediately return messages seeking comment. Lopez Obrador’s administration took power in December promising to rescue the company and restore its former glory. The president hails from one of Mexico’s top oil-producing states, Tabasco, where he has promised to spend $8 billion on a new refinery. He’s also granted Pemex 90 billion pesos ($4.7 billion) in tax breaks over the next six years and a 25 billion peso cash injection this year. Deputy Finance Minister Arturo Herrera has said that as much as $7 billion could be used from a stabilization fund to help the company with debt obligations over the next 18 months. For MetLife Investment Management, the Pemex calculation is fairly simple -- money managers there just think of the oil producer and Mexico’s government as essentially the same credit, and don’t sweat the price volatility. “We are confident that Pemex will work closely with all stakeholders to strengthen its position,” said Thomas Smith, an emerging-market portfolio manager for the firm.